Sometimes you come home after a long day of work or after an exhausting last minute christmas shopping and you are just to tired for a long beauty routine. Or you had a bad day and need a quick no effort christmasy pick me up. Atleast for me, in such situations there is nothing better then a hot shower with a nicely scented showergel. 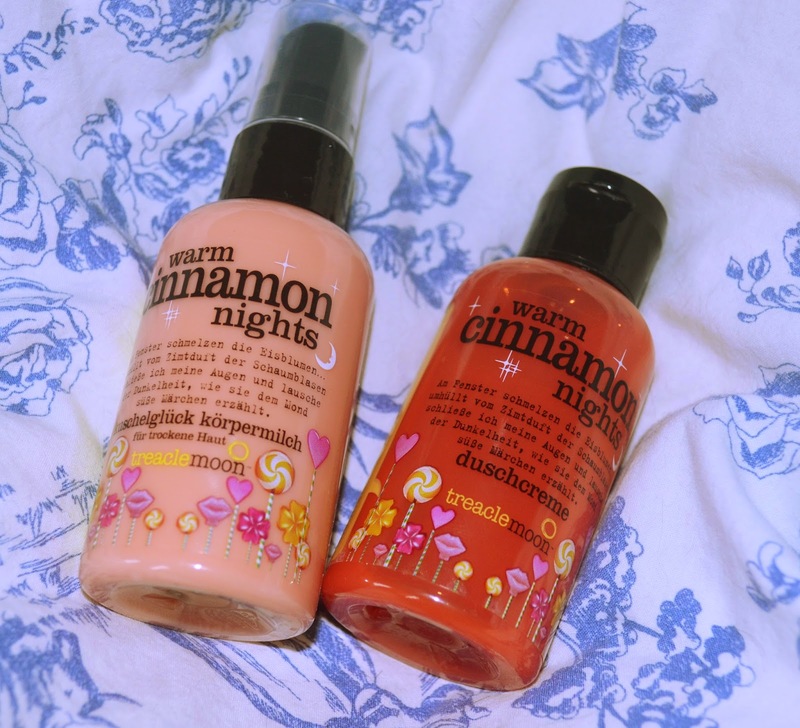 I had already bought some nice new body butters from the bodyshop but when this little bottles caught my eye, i just had to have them. This little travel sized bottles were under a euro each and have the most delightful christmas smell. I already used them three times and as you see, they are still rather full so those go a long way. I actually love that i was able to pick up this limited edition in this tiny size. The scent is very christmassy. It actually for me smells like mulled wine and christmas market. I love it but at the same time i would not want to be still using this in february and i have already quite an extensive collection of shower gels to use up. So ye those were perfect for me. For under two euro i can have my special christmas showers. Treacle moon is a brand i do not read a lot about. The bottles are quite a like to Philosophy or the "I love" series. However, this brand is very inexpensive. It is a british brand that comes without parabens or silicons and is animal cruelty free. The scents i tried so far were all really lovely and natural and not artificial smelling at all. Their shower gels are really amazing. The body milks are not over the top moisturising but it does a decent job and i do not break out from it which i do a lot from bodymilk. Those small bottles make lovely addons for gift by the way. In fact i bought quite some of them to add to the top of christmas gifts. Have you tried anything from treacle moon? What are your thoughts?